Towards a Skills for Life Passport The key components involve a 45 minute presentation followed by a 30-45 minute skills group which will improve students understanding of how stress may affect them, how best to cope with difficult periods / transitions in College using the ‘5 ways to Wellbeing’ and Mindfulness, and how best to seek support when it is needed. 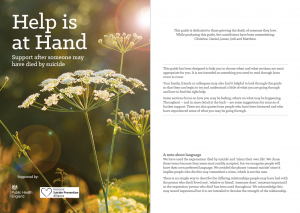 Help is at Hand: Support after someone may have died by suicide This guide has been designed to help you to choose when and what sections are most appropriate for you. It is not intended as something you need to read through from cover to cover. 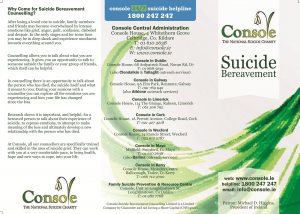 Suicide Bereavement Leaflet 2014 After losing a loved one to suicide, family members and friends may become overwhelmed by intense emotions like grief, anger, guilt, confusion, disbelief and despair. In the early stages and for some time you may be in deep shock and experience numbness you may be in deep shock and experience numbness towards everything around you. 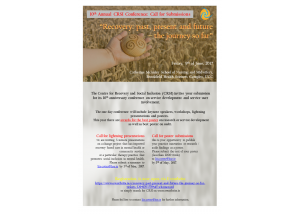 Be Mindful - Learn Mindfulness The Mental Health Foundation is working to end the inequalities that face people experiencing mental health problems. They develop and run research and delivery programmes across the UK and use what we learn to inform and influence government policy, offering straightforward and clear information on every aspect of mental health. 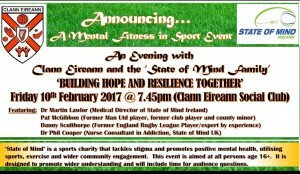 Performance Matters - Mental Health and Elite Sport Sportspeople experience a unique set of pressures in their jobs from scoring goals and winning trophies to facing media scrutiny and meeting the high expectations of adoring fans. While these issues make for an out of the ordinary workplace, in essence they are all linked to employment. The managers, coaches, clubs, governing bodies and player’s unions all have a role in supporting sports professionals to manage their mental wellbeing at work. Right Here - How to provide youth-friendly mental health and wellbeing services This ‘How to’ guide is one of a series of guides designed to bring together learning from the fiveyear Right Here programme initiated by Paul Hamlyn Foundation (PHF) and the Mental Health Foundation (MHF) to support the mental wellbeing of young people aged 16–25. Wellbeing - A Guide For Young People This booklet is about mental health. It will give you some basic information and advice about how to look after your mental health including tips on how to cope better with stress.